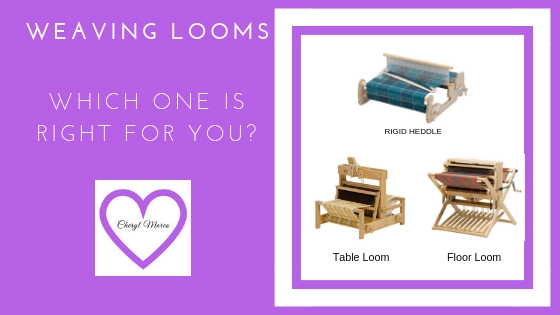 Rigid Heddle Loom, Table Loom, or Floor Loom: Which weaving loom is right for you? Before I get into the differences/similarities of the weaving looms, let me give you this comparison. These three vehicles are all modes of transportation but require different levels of exertion on your part. 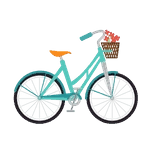 A bicycle will get you where you want to go but you have to peddle your way and allow sufficient time to get to your destination. 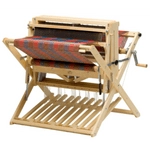 The rigid heddle loom will weave cloth in plain weave or with manipulation of the warp threads and heddle or heddles can weave more complex weaves. Weaving requires more time and effort by the weaver. 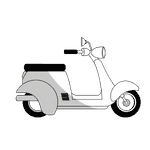 The moped will get you to your destination faster without as much exertion on your part. A table loom has a more complex set up, but, once warped, you can speed along weaving. 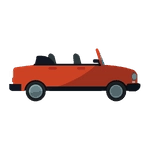 A car is the more complex but speediest. Likewise, the floor loom has complex set up but can handle a longer warp and more complex weaves. A rigid heddle loom consists of a frame that has notches on the bottom so it can be propped against a table for weaving or a stand can be purchased for weaving. The loom frame has notches to hold the heddle. Some looms have notches for more than one heddle. The magic is in the heddle. It has 3 functions: makes the shed, establishes the sett (number of warp ends per inch [epi]), and beats in the weft. Notice that the heddle has slots and holes. 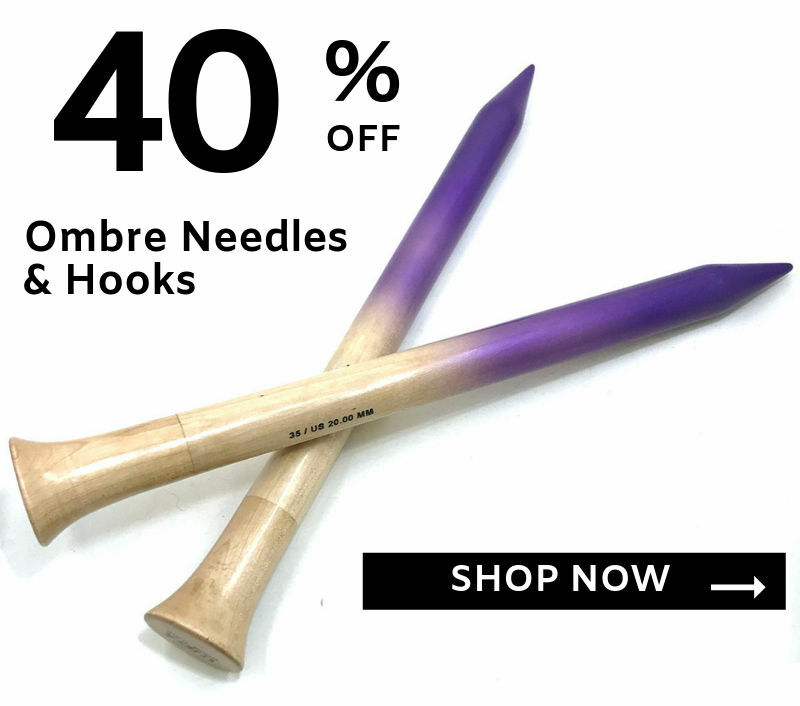 These do the work of the heddles found in table or floor looms. The heddle rests in the notches on the loom frame. There are three positions: Up, Neutral, Down. The loom is warped with the heddle in the neutral position according to your pattern with a thread in each slot and hole. Warping can be either direct or indirect. With direct warping you measure the warp and thread the heddle simultaneously. Indirect warping involves measuring your warp on a warping board and threading the ends into the appropriate slots and holes in the heddle. With the loom warped, you simply lift the heddle, throw your shuttle, and use the heddle to beat in your weft. 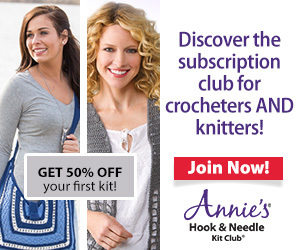 Next, you push the heddle down, throw your shuttle, beat the weft with the heddle. This is plain weave. To weave other than plain weave requires manipulation of the warp threads with a pick up stick or configuring for a second reed or stick with string heddles. Some weavers love these extra challenges. Not all rigid heddle looms have enough room in the frame for additional heddles. 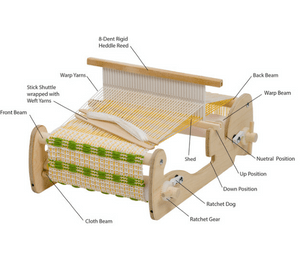 Rigid heddle looms are the most compact of all of the looms. 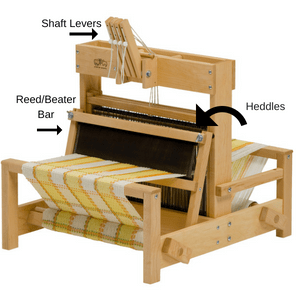 Some rigid heddle looms may be folded with warp on the loom. 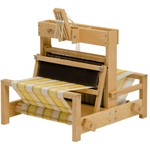 Rigid heddle looms can be found in a wide range of widths from 8”-48”. See my comparison of Ashford and Schacht Rigid Heddle Looms. A table loom is like a floor loom but you use your hands to work the shaft levers instead of your feet to lift/lower the shafts with the treadles. The loom is warped by measuring your warp on a warping board and then warping the loom by either the front or back methods of warping. This does take more time and care than the direct method used on a rigid heddle loom. 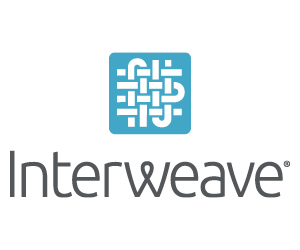 With four or more shafts, the weaver has all sorts of pattern capability just by the way the heddles are threaded and the shafts are lifted/lowered. Plus, the weaver still can manipulate the warp threads for design work with a pick up stick. The looms range in width from 12”-32”. 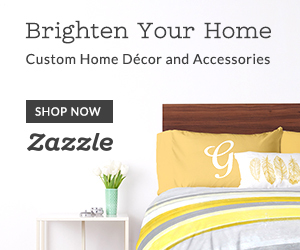 They usually come with either 4 or 8 shafts and more shafts may be available. Floor looms can be found in all sorts of configurations. There are folding floor looms. My comments will be about the Jack loom. 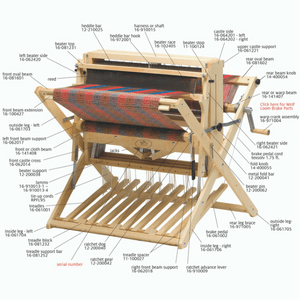 The Jack loom is the most popular here in the United States. Instead of levers, the Jack floor loom has treadles. You warp your loom and tie the treadles to the appropriate shafts/harness called for in your pattern. 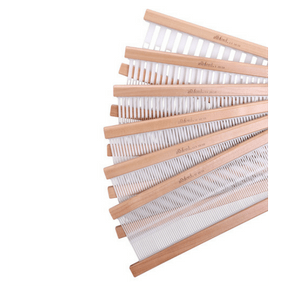 It takes time to measure your warp on a warping board, warp your loom (front or back method) by threading the warp through the heddles on each shaft, threading through the dents in the appropriate size reed, and fastening to your front beam rod. Next, you need to tie the appropriate shaft to the corresponding treadle per your pattern. Now, you are ready to weave. The weaving looms that I have used the most are the rigid heddle loom and the floor loom. I have used the table loom but found I never could get a good rhythm with the table loom as you have to lay your shuttIe aside and work the levers for the next shed. My most used loom is one of my rigid heddle looms. 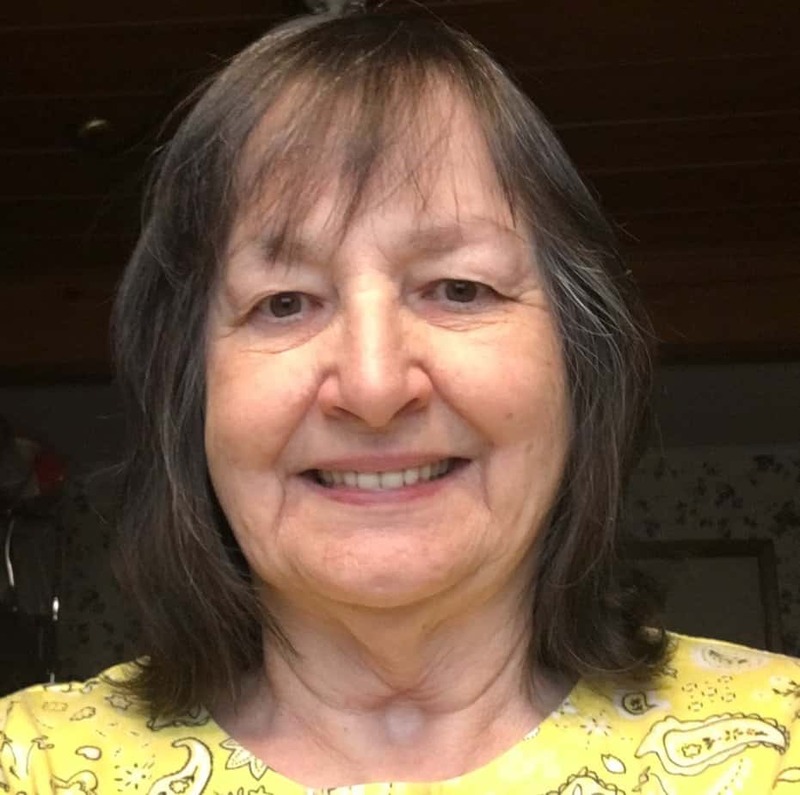 On my rigid heddle loom I have woven traditional items, tapestry weaving, and I have used the loom to hold my card weaving. For more complex or larger projects, I use a floor loom. The floor loom is also used when I need a really long warp or lots of one type of item. 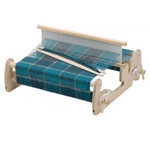 A rigid heddle or table loom cannot hold as much warp as a floor loom. 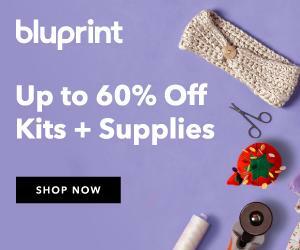 So, in conclusion, which type of weaving loom is right for you depends on what you intend to weave, the portability, finances, and available space you have for the loom.